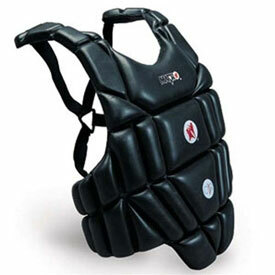 If you are looking for style and comfort in your sparring gear, the Martial Arts Vest is just what you're looking for. 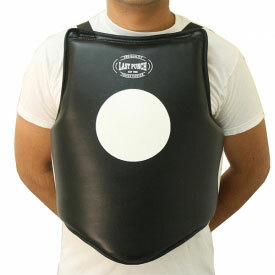 With adjustible elastic straps and a reversible design to allow you to change the color of the chestguard, you'll find this protective vest to be ideal for sparring. 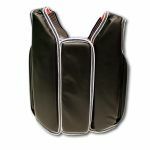 Not only do you get a great range of motion, but the reversible chest guard is designed with a velcro front so you can remove, reverse, and rewrap yourself with ease. 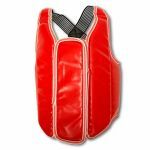 This convertible torso protector can be worn with black or red on the outside, both of which are fairly intimidating colors. You might not think that this matters, but some of us have taken to wearing these velcro torso guards around the office. Not only has this resulted in fewer hospital visits, but the intimidating colors have boosted productivity and driven away hooligans and ne'er-do-wells. 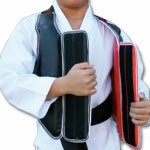 Get your own Martial Arts Vest and impress everyone you spar or work with. 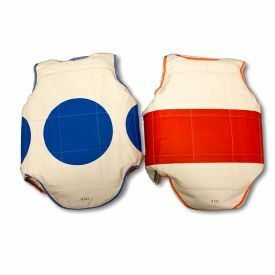 Length should equal the distance from the 2nd-to-top-rib to just above the groin.